Wild Republic. 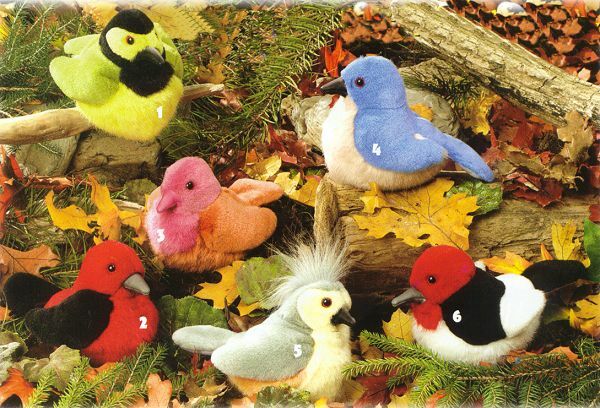 Each bird is an expertly crafted likeness, complete with its own authentic bird song. $7.95 each Wild Republic has joined hands with the National Audubon Society to empower its new line of birds. Each bird's lifelike design and detailing is the result of input from the Audubon Society. The sound each bird makes when squeezed is an authentic bird song provided by The Cornell Lab of Ornithology representing extensive in-the-field work conducted by expert recordists. Wild Republic's affiliation with these two bird organizations emphasizes its commitment to nature conservation.